Since starting this blog I’ve encountered many that want to use an antenna to watch TV. The issue that deters many of these folks is their HOA (Home Owner Association) rules and regulations. Well, today I’m going to tell you why the FCC’s Over-the-Air Reception Devices Rule or OTARD (lovely acronym) states that in a majority of cases your HOA cannot stop you from putting an antenna on your roof. When putting together a solution to watch TV without cable, many use an antenna to watch their local channels. Unfortunately some HOA organizations have written “no antenna” clauses into their rules. Many do not realize that this is usually in direct violation of the FCC’s OTARD rule. A Homeowners Association (HOA) or other organization can not prevent you from installing a TV antenna. This is clearly stated in the FCC OTARD rules. The Over-the-Air Reception Devices Rule (OTARD) are rules adopted by the FCC under the direction of the United States Congress according to the 1996 Telecommunications Act. The rule applies to restrictions imposed by local governments, including zoning, land-use or building regulations; by homeowner, townhome, condominium or cooperative association rules, including deed restrictions, covenants, by-laws and similar restrictions; and by manufactured housing (mobile home) park owners and landlords, including lease restrictions. The rule only applies to restrictions on property where the viewer has an ownership or leasehold interest and exclusive use or control. As you can see this pretty much covers most any private or public association or individual that may impose such a rule. There are rules on what a tenant can do to install an antenna on a dwelling they do not own. Aside from that however, there is little leeway in terms of restricting anyone from installing a TV antenna on a property they own. A local restriction that prohibits all antennas would prevent viewers from receiving signals, and is prohibited by the Commission’s rule. Procedural requirements can also unreasonably delay installation, maintenance or use of an antenna covered by this rule. For example, local rules or regulations that require a person to obtain a permit or approval prior to installation create unreasonable delay and are generally prohibited. Permits or prior approval necessary to serve a legitimate written safety or historic preservation purpose may be permissible. Although a simple notification process (e.g. post installation) might be permissible, such a process cannot be used as a prior approval requirement and may not delay or increase the cost of installation. The burden is on the association to show that a notification process does not violate our rule. A “distant station” is one that originates outside of a satellite subscriber’s local television market . . . Therefore if a broadcast channel is in your local media market, it is cont considered a “distant signal” and an antenna cannot not be profited to receive those channels. This includes channels that are widely viewable in your area. 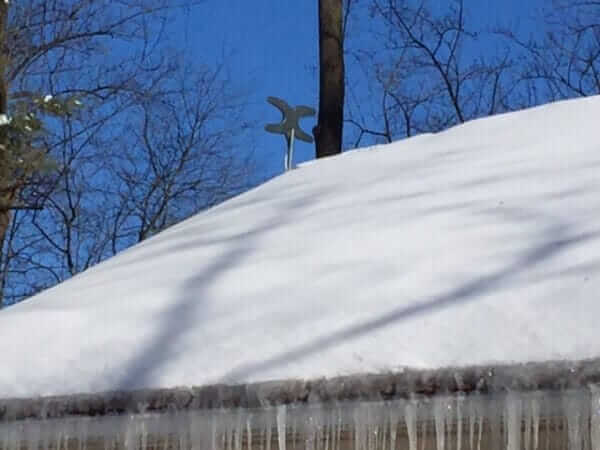 Therefore if you have a small outdoor antenna like the Mohu Sky 60 I have on my roof, you should be able to tuck it out of view to remain in historic compliance. There should also be ample opportunities to justify your antenna. All you would need to do is find a comparable sized modern device allowed in the community. If a device like a satellite dish is allowed then so should your antenna. So now that it’s clear that HOA’s cannot restrict you from installing a TV antenna in most cases, what can you do if you are facing opposition when trying to install one? The first thing I recommend is to play nice. First try to educate people on the law and try to make compromises as long as they don’t impede your ability to receive TV signals. Inform your HOA of the FCC OTARD rules in writing and at your local HOA meeting. Being combative tends to result in more conflict. If the HOA continues to be unreasonable, then you can call the Federal Communications Commission at 1-888-CALL FCC (1-888-225-5322), which is a toll-free number, or 202-418-2120. They should be able to help you.